If you add a subcategory, you will see the subcategory's name on the page. You can always Edit or Delete a subcategory. If you add an Item, you will see the Item's information and its picture on the page. To Edit an Item, go to the item you want to edit and click "Edit" under that item. To Delete an Item, go to that Item and click "Delete" to delete the item from your catalog. 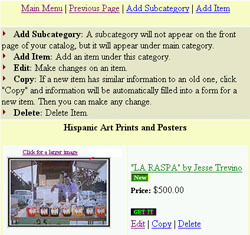 Click Browse to upload an image's thumbnail from your computer to your on-line catalog. This picture should be about 100 pixels wide. Click browser to upload a large image from your computer to your online catalog. This picture should be about 250-300 pixels wide. This is your normal price for the item. This price will appear as the Sale Price during the duration of the On Sale Period. Enter keywords related to your products to make it easier for customers to find them. The Search function searches all the words in your item's fields; use this for words that might be entered by a shopper but do not appear in the product's name or description. When you've finished, Click Add to add this item to your catalog. Click Update if you have been editing an existing item's information. Click Cancel if you change your mind and don't want to make the changes.